Imagine white sails, a gentle tropical breeze against your skin and the hand of your loved one in yours as you set sail on the azure Gulf waters. As the setting sun paints the sky with warm shades of yellow, orange and pink, the promises of love and a new life together are spoken. Is your dream wedding an intimate gathering on the water with the gentle rock of the waves beneath your feet? This dream can be a reality on our 53-foot catamaran Wild Hearts. 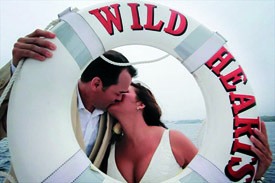 Weddings on the water are romantic and unique. We offer wedding packages tailored to fit your budget. We can accommodate a wedding party of up to 49 people. Or, we have a package for an intimate wedding with the couple and a handful of family and friends. An intimate ceremony with your family and friends. Daytime sail: $1750 plus 10% tax, plus 20% tip for crew. 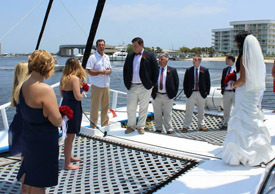 A destination wedding on the beautiful Alabama Gulf Coast with your family and friends. Fruit and cheese tray featuring fresh seasonal fruit and domestic and imported cheeses. Musician on Board: from $350 to $650 depending upon which musician/duo is available. Acoustical background music will be played during the ceremony and sail.